Not only do I think this rope is an amazing fitness device but its technology is so cool and fun to use. It's extremely durable and works as advertised. Lastly, I have to give props to the CEO. I had a question regarding the app which I emailed the support line at 9 pm and received a response back within 30 minutes......and it was from him! Very impressive I must say. I love my rope and use it everyday. What a great concept. The rope itself is nice, but I was looking foward to using the App. It always crashes or doesn't load. Kind of the point of "smart" and if the app isn't on then the rope won't keep "visual count" plus when I jump I either have to look straight up or down to see the jump count on the rope, rather than looking foward to keep neutral spine. Rather just have a regular jump rope at this point. Waste of $$ gimmick. This has been disappointing. It's difficult for us to hold the handles in exactly the right orientation to make the flashing numbers readable and in a position to be seen by the user. It seems to work best in dark environments so it's not very impressive in daytime or with strong indoor lighting. At best we were only able to make out an occasional numeral during multiple swings of the rope. 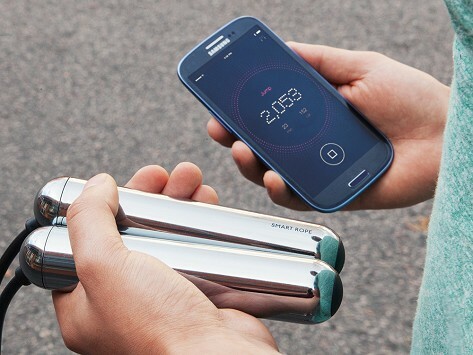 Meet a truly modern jump rope. The Smart Rope counts your jumps and shows them in real-time with a futuristic LED display that appears right before your eyes. It’s a slick, motivating feature. 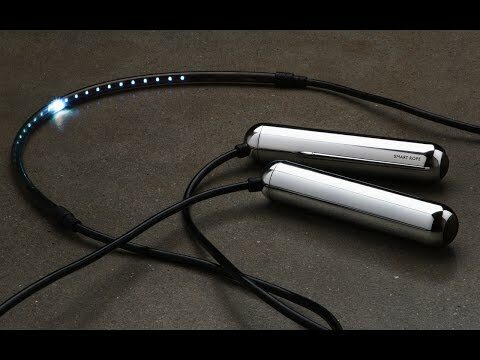 And this connected jump rope gathers even more data as you exercise. With specially designed handles, the rope rotates inside them as you jump. Via a Bluetooth connection to the Smart Gym app, you’ll see all of your fitness stats—like calories burned, time elapsed, and goals reached. The app even lets you connect with friends for extra motivation or to spark a jumping competition. Fitness buffs know that jumping rope burns calories fast and provides all-over toning. The Smart Rope is the first innovation from Tangram Factory, founded by two designers who worked in the tech and fitness industries. They wanted to combine this efficient exercise with a fitness tracker that doesn’t need to be worn.